Show a loved one they're special with our Chocolate-Strawberry Parfait for Two. 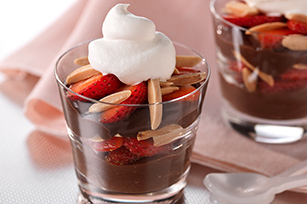 Chocolate-Strawberry Parfait for Two is even a Healthy Living Recipe! Empty pudding snacks into small bowl; stir in cinnamon. Spoon half the pudding evenly into 2 parfait glasses; top with layers of half each of the berries and nuts. Repeat layers. Prepare parfaits as directed, except do not top with COOL WHIP. Refrigerate up to 2 hours. Top with COOL WHIP just before serving. Substitute wine glasses for the parfait glasses. Garnish each dessert with a light sprinkling of additional cinnamon before serving.